The company revealed the Xbox One, its next-generation entertainment console, during a presentation on Tuesday at its headquarters in Redmond, Washington. Don Mattrick, Microsoft‘s president of interactive entertainment business, called it an “all-in-one home entertainment system.” He said the company has spent the past four years working on the next-generation Xbox. The console was demonstrated using voice control to seamlessly switch back and forth between watching live TV, listening to music, watching a movie, browsing the Internet, as well as simultaneously running apps. 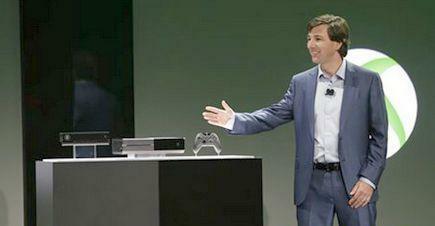 Microsoft also unveiled a new version of its camera-based Kinect system with better motion and voice detection. It’s been eight years since the launch of the Xbox 360. The original Xbox debuted in 2001, and its high-definition successor premiered in 2005. For the past two years, Microsoft has led the gaming industry in console sales with the Xbox 360. In recent years, Microsoft expanded the scope of the Xbox 360 beyond just games, adding streaming media apps and the family-friendly Kinect system. In recent years, Microsoft expanded the scope of the Xbox 360 beyond just games, adding streaming media apps and the camera-based Kinect system. Nintendo kicked off the next generation of gaming in November with the launch of the Wii U, the successor to the popular Wii system. The Wii U features an innovative tablet-like controller, though its graphics is on par with the previous-generation Xbox 360 and Sony’s PlayStation 3. Nintendo said the console sold just 3.45 million units by the end of March, well below expectations. Sony was next, teasing plans for its upcoming PlayStation 4 – without showing the actual box – at a February event in New York. The reaction to that console, which featured richer graphics and more social features, was mixed. Microsoft didn’t waste any time showing off the Xbox One console, new Kinect sensor and Xbox controller at the beginning of Tuesday’s presentation. Share the post "Xbox One game console"